Join Meeple Mountain as we welcome Vital Lacerda, designer of award winnings games like Vinhos, Kanban: Driver’s Edition, C02, and Lisboa, to the interview table! Welcome! You started working in the advertising industry and even had your own agency, but then switched to designing board games. What made you want to become a board game designer? VL: I played and changed rules from games since I was a kid and I was totally bored and tired about seeing my ad being changed because the client’s wife liked more the yellow than the blue. Do you feel that your background as an art director helps or hinders you when working with artists? VL: I think and hope so. I’m used to work with artists. I did it for many years almost daily. You have quite a range of themes in your games, from Car manufacturing in Kanban, to weather and atmospheric conditions in CO2, to wine making and distribution in Vinhos. How do you select a theme for your games? VL: I just look what is the most interesting to me at the time I’m looking for the game theme. Basically all my game themes are about my life interests. How do you research a theme in order to accurately portray it in a game? VL: Depends on the theme, but usually the same way everyone does. Using internet, visiting places and reading books. With Lisboa I had the luck of living there. For example, in Kanban, what kind of research did you do to accurately portray the inner workings of a car manufacturing plant? VL: I wanted a theme about a car factory and was researching about Henry Ford and learned how Toyota come up with a plan to survive again such a strong competition. Henry Ford factories had a lot of waste and the only color and model you could choose was a Black T1. So they developed the kanban system where using the same factory and assembly line it would be possible to produce different models with different colors and at the same time being much more efficient. So the game was born. What theme would you most want to revisit? 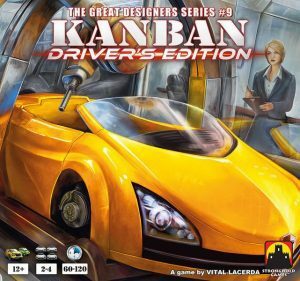 VL: Kanban, just for a deluxe version. Then I have a lot of different ones ready to go. 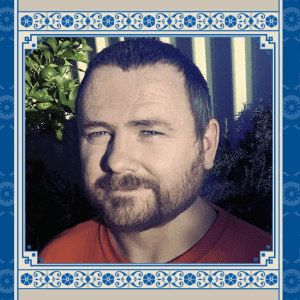 Ian O’Toole has done the art for many of your games including Vinhos Deluxe, The Gallerist, Lisboa, and Escape Plan. How did you get connected to him? VL: He wrote to me asking if I had a game for him because he was entering in the industry and liked my games. By coincidence I was looking for an artist for the Gallerist. And he did a great job. What attracted you most to Ian’s artistic design style? VL: His versatility, his artistic vision, the understanding of my vision, being able to do artist work and also graphics design. That’s his huge advantage comparing to other artists. But he also has others. He is a heavy gamer and always playtest their artistic and graphic work. Many artists don’t do it. Knowing the game is always a big plus to a great work. We also work with the same applications so, it’s easy to communicate ideas. VL: If he want it and find time to do it. Of course. It’s a no brainer. Pictures of On Mars have been floating around the internet recently. Can you tell us a bit about the mechanics of this game? VL: On Mars is a game about the first years of the colonization of Mars. Players are dependent from earth at the beginning and they will become self sustained during the game relying less and less on earth. You can expect some heaviness in the game, a lot choices and options to play. Looks like people is enjoying the game during playtest. It sounds like Weather Machine will have players competing as companies trying to manipulate an invention that can control the weather. Can you tell us a bit more about this one? Do we know when it will release? Who will publish? VL: Not much. 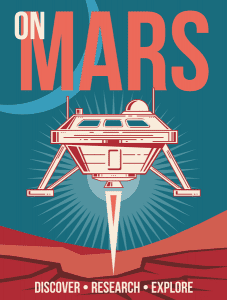 I began working on it a few years ago, but now its on the shelf while I’m designing On Mars. I have a few ideas, but no deadline to released it yet. Which one of your games do you see as the biggest success? Do you see any of your games as being a failure? Note that I’m not necessarily speaking commercially. VL: No failures yet. I love of my games, otherwise I won’t do it. And I don’t have much pressure to release a game. So I have the luck of being able to design what I believe in the most. That was also one of the reasons I left my advertising job. I don’t feel that I have a biggest success also. I’m always hoping that will be the next one. 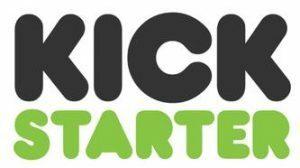 A number of your games have been launched on Kickstarter. How do you feel that platform has changed your relationship with the gameplayer base? VL: I think its a huge change in the industry, it will allow to much bigger and better productions in the games, allows the publisher to have a much better idea of the number of games to produce, and also to pay a better share to the people involved in the design process. This makes the companies in the industry more stable. The business plan is easier to manage and more companies can grow safe. I think that is a good thing to the industry and the hobby. But of course it’s more difficult to choose the games that they best fit you because many more games are constantly being released. But to me as a designer I think the online systems like Tabletopia was a much bigger change in the game design and the way of designing games that allows you to have a much close relationship with the players who like the designer games. Is there anything else you’d be interested in sharing with our readers? VL: Play good games, have fun doing it and don’t forget to be nice to your fellow players. Stay tuned for part two where we talk about Vital Lacerda’s game Escape Plan which recently ended it’s massively successful Kickstarter campaign. Great article. Thank you. I would like to hear more from VL. When should we expect to read part 2?